Los Angeles Dodgers' South Korean starter Ryu Hyun-jin has won his second consecutive start, while setting a new season high in strikeouts. Ryu held the San Diego Padres to two runs on three hits over six innings at Petco Park in San Diego on Monday (local time), striking out nine without issuing a walk. Ryu improved to 2-0, though his ERA rose slightly from 2.79 to 2.87. Ryu was relieved by Tony Cingrani to begin the seventh with the Dodgers ahead 6-2. Yasmani Grandal's grand slam in the top of the ninth put the Dodgers up 10-2. The Padres got a run back in the bottom ninth, but the Dodgers closed out a 10-3 win with ease. This was Ryu's third start of 2018. 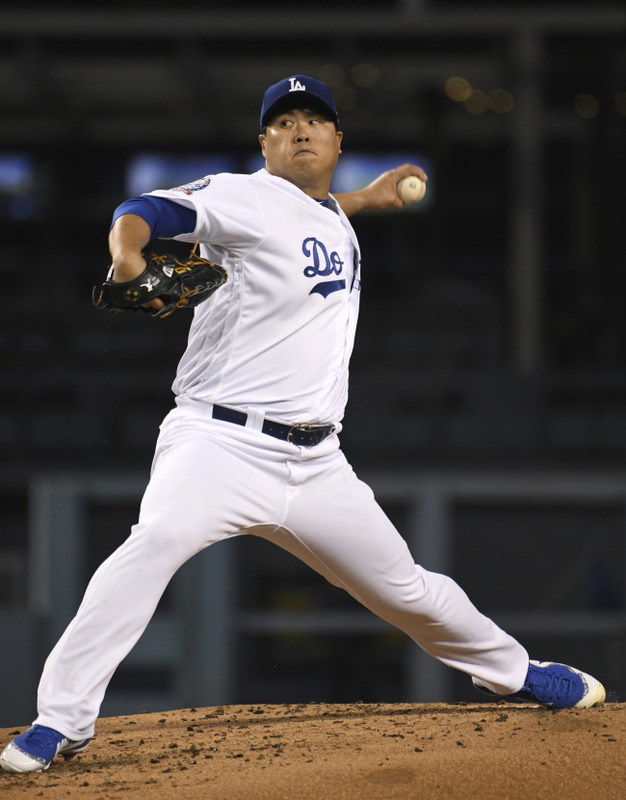 In his season debut on April 2, Ryu allowed three earned runs in 3 2/3 innings on five hits and five walks against the Arizona Diamondbacks. But he bounced back nicely in his next outing last Tuesday against the Oakland Athletics, throwing a one-hitter over six scoreless innings with eight strikeouts for his first win of the season. Ryu didn't quite have the command that he exhibited against the A's but still recorded at least one strikeout in each of the six innings. Of Ryu's nine K's on the day, seven were of the swinging variety. The left-hander got five of those nine strikeouts with four-seam fastballs, two with curves and two with changeups. "It was definitely nice," Ryu was quoted as saying by MLB.com "I always say I don't overpower the hitter, so command is very important. I'm very happy with my (start) today and how I contributed to the team winning. To have back-to-back outings with at least eight strikeouts is a reflection of my command." Ryu had been 4-1 with a 2.57 ERA in his seven previous starts against the Padres, with 41 strikeouts in 42 innings. He had been a perfect 2-0 at Petco Park with a 2.08 ERA across 13 innings. In his latest meeting with the Padres, Ryu threw three straight balls against leadoff man Jose Pirela but eventually recovered to induce a groundout. He then struck out Freddy Galvis swinging on an outside fastball. The Dodgers scored the game's first run in the top of the second, but Ryu gave it away in the bottom half of that inning. Hunter Renfroe led off the frame with a double, and Christian Villanueva took Ryu over the left field wall for a two-run home run. It was the first home run given up by Ryu in 2018. Ryu left his cutter high and out over the plate on both of the extra-base hits. But the pitcher settled down by retiring the next three batters in order, two of them with strikeouts. The Dodgers bailed out Ryu with a five-run third inning, powered by Matt Kemp's three-run jack, and Ryu found his groove, as he only allowed one more single the rest of his day. He recorded two more strikeouts in the bottom third. With one out in the fourth, Ryu hit a batter and give up a single but then got out of the jam by striking out Cordero and Carlos Asuaje. He picked up one more K in the fifth and again in the sixth. He retired his final eight batters in a row. Ryu threw a season-high 93 pitches, 57 for strikes. Hardly known for high strikeout totals in his six-year big league career, Ryu has fanned 19 batters in 15 2/3 innings so far in 2018, or 10.9 per nine innings. Ryu entered this game with a career strikeout per nine innings ratio of 7.8. His career high for a single game is 12 strikeouts against the Colorado Rockies on April 30, 2013. Ryu, 31, is in the final year of his six-year, $36 million contract. After winning 14 games in both 2013 and 2014, Ryu missed the entire 2015 season due to shoulder surgery. He came back to make just one start in 2016 before going down with elbow problems. Last year, Ryu was 5-9 with a 3.77 ERA, but so far in 2018, Ryu has looked closer to his previous self. "The last couple of years have been tough, especially last year when I lost more games than I won," Ryu told MLB.com. "Games like this one definitely help, and my teammates are helping me as well. My teammates had my back today, and I wish I could do this more often." Specifically, Ryu said getting five runs of support from his teammates in the third, after he'd given up a two-run homer to Villaneuva, was "the most important part of the game."